Arriving in Rome on a Saturday, my wife and I hiked from our hotel by the train station to the Spanish Steps with the intention of winding our way back towards one of our favorite restaurants. I had two lenses with me on the trip – a 24-120mm f4.0 and a 50mm f1.4. I bring the 50mm for these walks where the available light is low. We arrived at the top of the steps around dusk to a bustle of activity and an amazing view of blue from the sky and gold from the street lights. Knowing we were pushing ourselves on the first day, this burst of energy revitalized us for the rest of the evening. Ubiquitous to our trips to Italy are the street sellers with everything from glowing toys they toss in the air to flowers offered while eating in a restaurant. 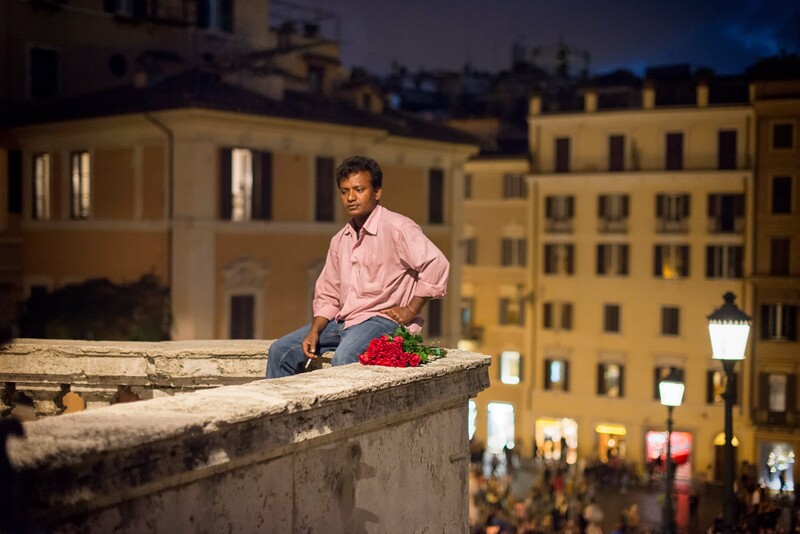 I found this flower seller taking a break from what must be a hard way to make a living. He looked tired, and the night was still young. This entry was posted in Low Light, Portraits, Street Photography, Travel Photography and tagged Italy, low light photography, photography, Rome, Spanish Steps, street photography, travel photography. Bookmark the permalink. Nice shot. So much story in this in this picture….. There is; it’s what I love about photography – telling stories. Thanks.